Russian weapons manufacturer Kalashnikov demonstrated its REX-1 anti-drone gun at the International Military-Technical Forum 'Army 2017' expo. 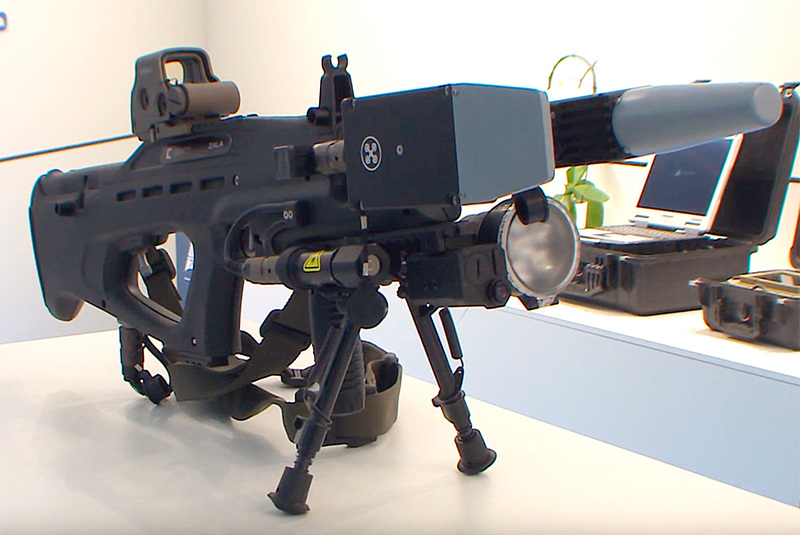 The REX-1 electromagnetic gun jams the GSM and GPS signals used for communication with drones and can even temporarily shut down a bomb planted by terrorists. For the first time in Russia, Kalashnikov Concern - the largest arms manufacturer in the country - showed off its electromagnetic anti-drone rifles at the Army-2017 expo in the Moscow Region. Prototypes of the REX-1 are also undergoing tests in the some subunits of the Russian National Guard. "This radiomagnetic 'gun' suppresses the command and control channels of the world's most commonly encountered drones. It’s also installed with a number of interchangeable electromagnetic and infrared units that suppress GSM, GPS, GLONASS, Galileo [the last three are various types of satellite navigation systems - RBTH], and other channels," Nikita Khamitov, head of the special projects department at Zala Aero Group - the company that developed the new weapon and is part of Kalashnikov Concern - told RBTH. According to Khamitov, it’s possible to change each component in a matter of seconds, just like changing the magazine on an assault rifle. The gun is able to “fire” continuously for four hours. It can then be recharged for four hours using an ordinary 220-volt socket, or connected to an additional battery for uninterrupted use. Drones usually have two default modes in case communication is lost with the operator: They either return to the start point or automatically land. "In the latter case the drone will disappear from enemy radars, and you effectively have a new toy in your hands," Khamitov added. "A particular feature of the device is the possibility of not just neutralizing unmanned aerial vehicles but also explosive devices triggered by remote control - via a phone call or text message, as one sees in films. The gun shuts out all external signals and gives the combat engineer group time to arrive on the spot and completely eliminate the threat," Khamitov said. The REX-1 also has a feature that may or may not prove useful on the battlefield. When operating it shuts down all Wi-Fi, 3G, and LTE signals within a radius of one kilometer of its electromagnetic beam, which is invisible to the human eye. So if you're streaming a film to your laptop near the location where a bomb has been planted - sorry, you'll just have to be patient. According to Khamitov, a version of the gun could also be designed for the civilian market. But not all its functions would be made available - for instance, in the civilian version the GPS neutralizing device would not be included. The price of the weapon will be determined in due course when the subunits of the Federal National Guard Troops Service decide the number they want to procure. "Looking at the market, I think the civilian version of our system could cost around $5,000," Khamitov said.